An altered chord is one in which one of the notes has been moved up or down one fret on the ukulele. The most common altered chord is the augmented chord. These are represented with the shortened form of aug (for example, Gaug) but you can also see them written as G+ or G+5. The augmented chord raises the fifth of a chord by one fret. That means the augmented chords are a similar shape to the major chord. This shows the Caug chord (like the C chord but with the g-string played at the first fret), Aaug and Gaug. Caug, Aaug and Gaug chord diagrams. Just as you can augment the major chord, you can also augment seventh chords to make my favourite chord: the augmented seventh chord. 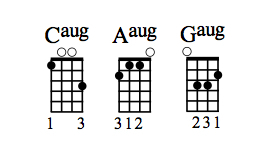 This image shows the chord shapes for Caug7 and Aaug7. 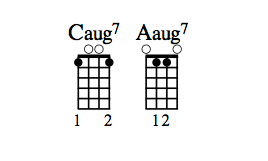 Caug7 and Aaug7 chord diagrams. The augmented seventh chord is perfect for putting at the end of a chord progression right before you head back to the home chord. Because it’s slightly dissonant it’s restless and creates anticipation in the listener. Try playing the chord progression below: F – Dm – Bb – Caug7. When you play Caug7 listen to how unfinished it sounds. It forces you to play an F chord afterwards to bring things to a close.